(Newser) – It's a toothy giant that can grow longer than a horse and heavier than a refrigerator, a fearsome-looking prehistoric fish that plied US waters from the Gulf of Mexico to Illinois until it disappeared from many states a half-century ago. Persecuted by anglers and deprived of places to spawn, the alligator gar—with a head that resembles an alligator and two rows of needlelike teeth—survived primarily in Southern states in the tributaries of the Mississippi River and Gulf of Mexico after being declared extinct in several states farther north. To many, it was a freak, a "trash fish" that threatened sport fish, something to be exterminated. But now, reports the AP, the alligator gar is being seen as a valuable fish in its own right. Man has a pretty poor record of playing around like this. We introduce one species to eliminate or control another, and pretty soon the new species is a problem in and of itself. While carp are usually considered undesirable from a game-fishing point, they are a delicacy to many people. 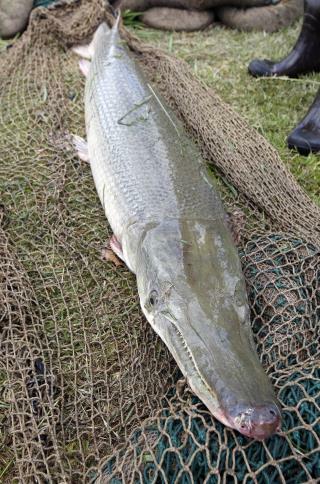 Yes, gar are aggressive, which may be how they survived so long (not to mention those choppers up front! ), but next thing we see will be scientists looking for something to control the alligator gar population! They need to rethink this, because I don't think they've thought it through well enough. The carp can be eaten. It's supposed to be a tasty fish, better than Tilapia, it's just not popular. So stop referring to it as Asian carp and start referring to it as Silverfish, and put it on the menu everywhere up and down the Mississippi. Its population will be reduced fairly quickly. I have a friend who was attacked by one of these fish a few years back. It ripped a chunk out of her calf. It was horrible.